A bell is a simple musical instrument. 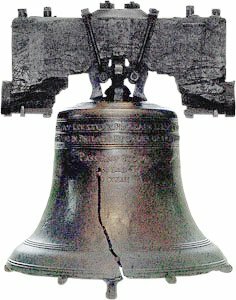 Most bells are made of metal. Bells are also in churches to announce the time between hours. Ships usually carry a ship's bell. Some bells are in bell towers. This bronze bell dated from medieval times, depicts Saints Peter, Paul, John the Evangelist, and Thomas. The Walters Art Museum. Spectrum of a Winchester Cathedral bell as analyzed by Jonathan Harvey using FFT. "The bell produces a secondary pitch (f') which lies outside that 'inharmonic series though it is clearly audible when the bell is struck, 'to curiously thrilling and disturbing effect.'" The strike tone is middle C, the hum tone an octave below. The Erfurt bell (1497) or any well-tuned bell: strike note on E, with hum note an octave below, minor third, fifth, octave or nominal, and major third and perfect fifth in the second octave. 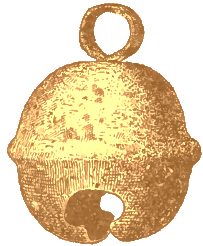 This copper bell was made by pre-Columbian North American natives. The bell within the Clock Tower colloquially known as Big Ben. Mingun Bell weighs 55,555 viss, or 90 tonnes. Tsar Bell, by the Motorins. 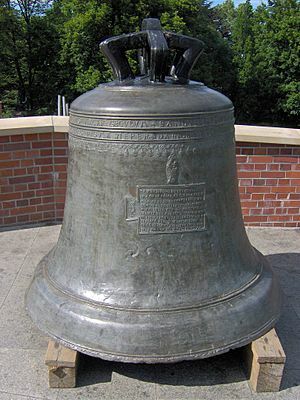 The Zygmunt (Sigismund) Bell in Kraków, Poland. The World Peace Bell in Kentucky. St. Petersglocke (with person for scale). Bronze jingyun bell cast in the year 711 AD, Xi'an. Chinese bells from the ancient Warring States, Hubei Provincial Museum, Wuhan, China. Bell Facts for Kids. Kiddle Encyclopedia.